Thank you for your interest in Sponsoring A Page on ConwayLiving.com! You might also like to know about Directory Listings, Company Profiles, and other Promotional Avenues! We have hundreds of pages for you to run your ad on! Sponsor A Page Today! 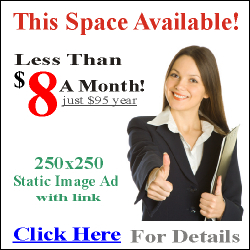 Any Page - Only $95.00 a year! That's right! Only $95/year! That's less than $8 a month! It's first-come-first-served so visit our pages and find the one you would like to sponsor... if you see the sponsor this page 250x250 ad on the right side of the page, - just like it shows on this page - then that page is available! Hurry back here to this page to grab your page! Our suggestion here is that you first try to sponsor one of our most popular and most visited pages! News, Jobs, Events, Weather, Reviews, Photos, etc... the pages that are links up at the top and bottom of our pages.... then look for the pages that are linked inside of one of those pages.... for example the Gas Prices page that is linked from inside of the News page.... then look for a category page inside of our Directory! ie, Florist, Automotive Dealership, Restaurant, etc. And yes, you may sponsor more than one page with us! However, please understand that we only allow a company to sponsor 1 of our main pages (news, events, photos, weather, products, etc.) but a company can sponsor as many directory pages as they would like. Here Is The Best News! As our way of saying thank you for your support and for being the first company to sponsor a page with us, YOUR RATE WILL ALWAYS BE WHAT YOU SIGNED-UP FOR! Even 10 years from now you will pay the same rate that you signed-up for today.... So in this case - Only $95 a year! Even if our rates do go up, and they probably will come next year, each year you will have the choice to renew your ad or cancel your ad.. it's totally up to you! If you renew, you will pay the same rate, if you cancel, you will owe nothing more... however, just remember if you do cancel your ad next year, and then a few months later decide to run it again, you will have to pay our current pricing at that time. Make sure you take advantage of our offer while it is still available! Less than $8/month for sponsoring a page is a small price to pay for being part of and linked-in to a large network like we are! We are part of The Conway Business Directory, Discover Conway, Conway Careers, and many sites of the OnTheGrandStrand.com network! We will run your 250W X 250H image with a direct link to your company profile with us on Conway Living! Need an Ad? Well guess what! As a special service just for Conway SC Companies, our editor, Joey O'Connor, thru his pr/marketing/media division - Carolina Coastal Media - will MAKE A FREE AD FOR YOU! Once you complete the submission process below, he will make a 250x250 image ad for you to use with us here on Conway Living! To sponsor a page, all you need to do is complete the form below and pay for your ad and we will get it all set-up and running! It's that simple! Check This Out! --- We will also give you extra targeted exposure by "sharing" the news of your new page sponsorship on ALL of our social media accounts!! LinkedIn... Twitter... Google+... and of course our ever popular Facebook Page with 4,200+ followers! And our editor, Joey O'Connor, also shares it on his personal page too! (2,200+ friends) So that should bring some pretty good instant attention to your new page sponsorship! Many of our previous shares about new profiles or page sponsorships have been reached out to 600-1,600 people in just the first 48 hours alone! How's that for some free bonus exposure! Please Note: You must already have your 250W X 250H image located somewhere on the web (facebook, flickr, your website, etc.) and know the URL location to it before you submit below. We will then be able to copy your image from that location and add it to our servers. You would then be able to delete your image from its' location if you would like. Need an Ad? If you would like to take advantage of our editor making you a free 250x250 image ad, simply type in I NEED A FREE AD in the "location of your 250x250 image ad" field below and Joey will personally make one for you! He will visit your website, facebook page, twitter, your other social media pages to find images and information that he might need to make you a great looking ad! If you should have any questions about sponsoring a page please don't hesitate to give our editor, Joey O'Connor, a yell! His direct email address can be found at the bottom of this page! Thanks! (Optional) Salesperson Code / Promo Code / Representative Code - if you have a code then please enter it here for proper tracking of your listing. All ad submissions will be reviewed for context and accuracy before indexing. We reserve the right to refuse any listing for indexing and can remove any current listing for bad, abused, non-working or corrupted links and has no obligation to notify the person or the company that submitted the listing. There will be no guarantees of contacts from your listing and there will be no refunds once a submission has been paid for and/or indexed. Submissions will be indexed after payment has been received. By clicking on the Submit button you agree that you are authorized to submit the listing, that the listing is correct, that you are authorized to pay for the listing, and understand the above. Once your submission and payment has been received and approved, your listing will be indexed within 3 business days. After you click Submit, you will be re-directed to a payment page where you will need to pay for your listing immediately using your credit card, debit card, or bank draft thru our secure processor or you may log-in to PayPal. For the ultimate in your security, we will never see your credit card numbers or your bank information! 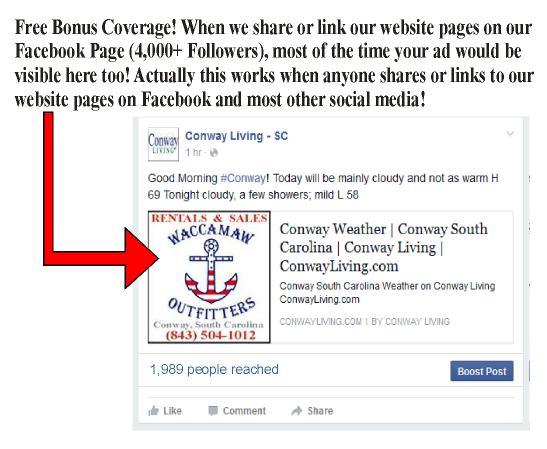 Please Note: Company running ad must be located in/around Conway, SC and/or The Grand Strand area of SC/NC and already have added their lifetime company profile with us on Conway Living. Absolutely NO adult content, NO ads of offensive content, and NO job site related ads allowed. Sorry, This Page Is Not Available For Sponsorship. Ad Shown Above For Reference.